A simple pushbutton interface makes the OP12 easy to use in rough conditions, and reliably responsive to wet or gloved hands. Dedicated auto and standby buttons enable or disable the autopilot with a single press, so it’s easy to free your hands from the wheel or instantly take control whenever you need to. The ‘mode’ button engages NoDrift steering or navigates to the current waypoint on your Simrad chartplotter, while dual port and starboard buttons allow course adjustments in one-degree or ten-degree increments. Smartly shaped buttons let you distinguish between increments at a touch, for safe operation in low visibility. The OP12 is simple to mount, and offers single-cable NMEA 2000® connectivity for both power and data. Multiple keypads can be installed to offer autopilot control from anywhere on board, perfect for dual-helm vessels. 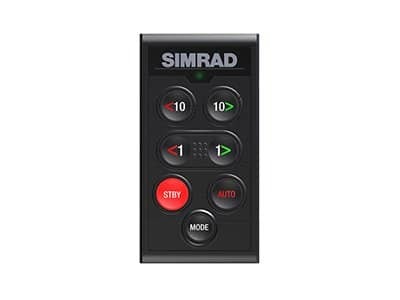 Pair the Simrad OP12 keypad with an IS42 Colour Instrument Display to create a fully functional control head for your compatible Simrad autopilot system. Leverage Simrad Continuum autopilot technology to steer to a set course, maintain your heading against wind and tide with No Drift steering, and fish or cruise easier with automated turn patterns and depth contour tracking. Designed to complement Simrad glass helm displays and instruments, the OP12 features modern styling with a low surface-mount profile of just eight millimetres. A compact footprint enables mounting almost anywhere, while still offering large buttons for easy operation by gloved hands or in heavy seas.